The mild-mannered TLX deserves recognition for its composed driving dynamics and comfortable interior. While its gaping grille and bejeweled headlights are undeniably distinct, the rest of its exterior design borders on the ho-hum. Under the hood is a standard 206-hp inline-four with an eight-speed dual-clutch automatic transmission or a 290-hp V-6 with a nine-speed automatic. 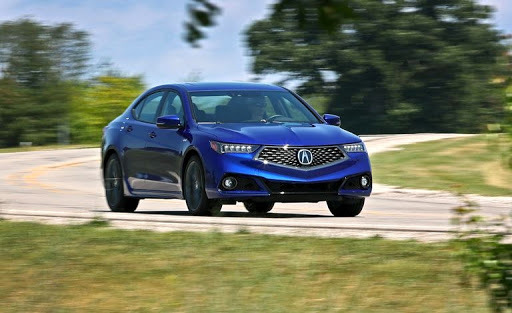 Front-wheel drive with supplemental rear-wheel steering that aids handling is standard; V-6 models are available with Acura’s all-wheel-drive system. The TLX’s tasteful interior offers cozy seating, attractive appointments, and choice standard features. A stable of driver assists including automated emergency braking and adaptive cruise control are also standard. The TLX isn’t thrilling, but its quiet competence and refined performance are underappreciated compared with flashier competitors that steal the spotlight. The TLX receives a refresh that includes a much-needed facelift, updated technology, and new additions to option packages. Most notably, Acura ditched the bleak beak for a much handsomer pentagonal grille with a diamond-mesh insert. Acura also revised the TLX’s front bumper and fenders, hood, side sills, and rear styling. Along with reshuffling the base model’s standard features and packaged equipment, Acura fits every TLX with a redesigned infotainment system that features a simplified interface, quicker response times, and Apple CarPlay and Android Auto capability. All models now also have forward-collision warning, automated emergency braking, lane-keeping assist, and adaptive cruise control. In total, our TLX 3.5 SH-AWD costs $40,284—a reasonable price for a well-equipped entry-luxury sedan.